The Department of Zoology, Central University of Jammu (CUJ), Rahya-Suchani (Bagla), District Samba in collaboration of Wildlife Protection Department, Jammu and Kashmir organized the one day symposium on combating illegal wildlife trafficking for the frontline staff. The event was organized to sensitize and for spreading of awareness among the forest staff about the issues of illegal wildlife trafficking and the methods to tackle this for the conservation of faunal diversity at national and international levels. The forest staff, thirty each, from the three departments namely Wildlife Protection Department, Forest Protection Force and Territorial Staff were present. The event was graced by the presence of the chief guest (inaugural session) of the symposium of the worthy Vice-Chancellor, CUJ. He guided the gathering with his exemplary knowledge and stressed for the conservation of our natural resources and protection of biodiversity. In the opening session Professor N. K. Tripathi, Dean School of Life Sciences and HOD, Department of Zoology, CUJ) delivered the welcome address. Sh. 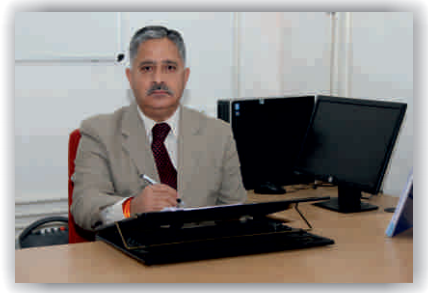 Suresh Kumar Gupta (Chief Wildlife Warden, Jammu and Kashmir), Sh. Tahir Shawl (Regional Wildlife Warden, Jammu), Mr. Franchoi (CCF, Ecotourism), Sh. Sahzad (Wildlife Warden, Jammu), Dr. Vinay Vishal Sharma (Veterinary Officer, Manda Deer Park) and Sh. Amit Sharma (Jambu Zoo., Jammu) were present from Forest Department of Jammu and Kashmir. Dr. S. P. Goyal, Emeritus Scientist a pioneer in the fields of Wildlife Forensics and Conservation biology, Wildlife Institute of India, Dehradun was the keynote speaker for the event. He spoke on the topic of ‘Development and role of forensics in wildlife conservation: What we learn from ca. 3000 offences’. In afternoon session Dr. Vinita Sharma, Assistant Professor, Department of Zoology, (CUJ) gave presentation on the topic of ‘Illegal wildlife trafficking of horn trophies in India: Tools for species characterization following morphometric approach ‘HORNID’. Dr. Puneet Pandey, Assistant Professor, Amity Institute of Forestry and Wildlife, Amity University, Noida, UP spoke on the topic of ‘Conserving big cats through technical and scientific cooperation in Asia’. Dr. Vipin, UGC-Dr. D. S. Kothari Postdoctoral Fellow at Department of Zoology, CUJ spoke on the topic of “Recent advances & future perspectives in diseases, age determination and forensics in wild animals”. The valedictory session was graced by the presence of the chief guest Honorable Sh. Manoj Kumar Dwivedi (Commissioner/ secretary to the Government Forest Department), Sh. Sameer Bharati (Chief Conservator of Forests, Jammu and Kashmir), Sh. Asif Mahmood (Director, Forests Protection Force, Jammu and Kashmir), Dr. Stanzin Ladol, Assistant Professor and the students of the M. Sc. Zoology (Five Year Integrated) course, Department of Zoology, (CUJ) were also present at the event. Miss. Radhika Bhagat, Program Officer, Wildlife Trust of India was also present at the occasion. The symposium was ably anchored by Miss. Ayesha Shabir the student of the Department of Zoology, CUJ.